A container's neck finish holds the cap, stopper, or closure with protruding threads. A container and its corresponding cap must have matching finishes. For example, a 24/400 bottle will only accept a 24/400 closure. 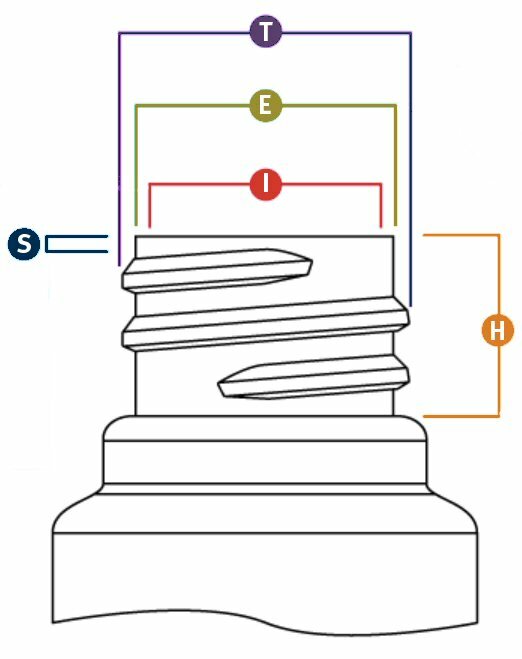 Screw thread or continuous thread closure sizes are expressed with two numbers separated by a hyphen or slash. The first number refers to the millimeter diameter measured across the inside of the cap's opening or the outside of the bottle's threads. The second number refers to the thread style, "GPI" or "SPI" finish. The Glass Packaging Institute (GPI) and Society of the Plastics Industry (SPI) are responsible for establishing uniform standards for glass and plastic container neck finishes. The closure industry does not necessarily adhere to the same standards, so it is often best practice to purchase containers and caps from the same manufacturer when possible. For information about proper torque when applying closures to containers, visit our Torque Guide page. Outside diameter of the thread. The tolerance range of the "T" dimension will determine the mate between bottle and closure. Outside diameter of the neck. The difference between the "E" and "T" dimensions divided by two determines the thread depth. Inner diameter of bottle neck. Specifications require a minimum "I" to allow sufficient clearance for filling tubes. Linerless closures w/ plug or land seal & dispensing plugs/fitments require controlled "I" dimension for proper fit. Measured from the top of the finish to the top edge of the first thread. The "S" dimension is the key factor that determines orientation of the closure to bottle and the amount of thread engagement between the bottle and cap. To find a cap's diameter, measure from one side of the inner wall to the opposite side. Calculate a bottle's neck finish by measuring the diameter of the outermost threads. The resulting millimeter measurement will be the "T" dimension. Then, see how many times the threads pass one another to determine the finish.